Posted May 7, 2018 & filed under #KidsNeedBooks, At-Risk Kids, Poverty. 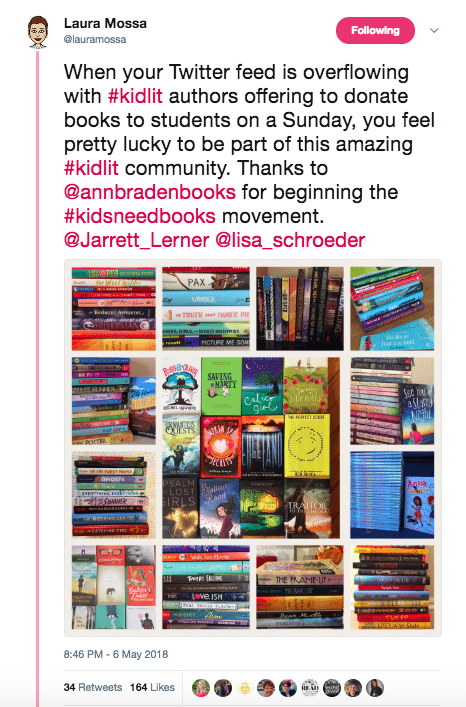 A few weeks ago, the brilliant Donalyn Miller published a #NerdyBookClub post that highlighted a simple but powerful truth: kids need books. I’m a former middle school teacher, so I know how many obstacles can stand in a teacher’s path, and how many teachers push forward anyway determined to support their students with whatever resources they have. And I also know how hard it can be for many kids to have access to new books. So, when I lucked into a bag of new middle grade books at a Vermont Library Conference this past Friday, it made sense to post of picture of them on Twitter and offer them to a classroom that needed them — especially because I know there are teachers who are hoping to send each child home with a book at the end of the school year. But what I didn’t expect (although, in retrospect, I should have) was the response. There are SO MANY teachers who are passionate advocates for their students, working to support them as readers and eager to place these books into their hands. And THEN, author Jarrett Lerner decided to offer a stack of books of his own, and suddenly more and more authors and other book-lovers were following suit offering their own stacks of books! As of right now there are over 50 separate stacks of books being be given away, so we can reach over 50 different classrooms!! Yes, we need the institutional change that will recenter the needs of students and the voices of teachers in decision-making about school budgets, but in the meantime, let’s bring together those of us who love books and love kids and figure out the best way to make sure as many students as possible have access to books this summer. As one teacher said of her student who lives with her family in a motel told her, “In the summer I turn into something I don’t like because I have nothing to do.” I know that there are so many kids just like her, and I am so incredibly grateful to all the authors who have stepped up with such generosity of spirit so that we can reach as many classrooms as possible and give those kids the books they need. There are several giveaways still underway (I’ll link to them at the bottom, so you can make sure you’ve entered), but I wanted to announce the first round of winners! If you won, please contact me with your mailing address, and I’ll ensure your stack of books gets to you and your students! Ann Braden’s original set of books goes to….Elizabeth (@elizkyser)! Ann Braden’s 2nd set of books goes to…. Bonnie Belsinger (@belsinger)! Augusta Scattergood’s MG set of books goes to…. Lori Barber (@barberchicago)! Augusta Scattergood’s YA set of books goes to…. Kristen (@Eatbooks4brkfst)! Rebecca Caprara’s stack goes to……Kris (@readingteachkbp)! Monika Schroeder’s stack goes to…Tina Stimpson (@tina_stimpson)! K. A. Reynolds’ stack goes to…. Laura Mossa (@lauramossa)! Janet Fox’s stack goes to…. Susan Sullivan (@SusanLSullivan)! Wendy MacKnight’s stack goes to… Clint Whitten (@TeacherWhitten)! J. H. Dielh’s stack goes to…. Susan Griffith (@fivewazoos)! Beth Bolland’s stack goes to…Christopher Rushing (@rushing_teach)! Amber Elby’s stack goes to….Ms. Horner (@msshorner)! Robin LaFevers’ stack goes to….Mikal Brennan (@Mikalke)! Jarrett Lerner’s MG stack goes to….Tamie Williams (@Librarystarr)! Jarrett Lerner’s YA stack goes to….Thea Smith (@MLCTheaSmith)! Monika Schroeder’s stack goes to… Tina Stimpson (@tina_stimpson)! Laura Shovan’s first stack goes to…Tori Glass (@tori_glass)! Laura Shovan’s second stack goes to…Jared Leaman (@Jlea85)! Ginger Johnson’s stack goes to… Jill O’Connor (@OConnorJill)! Lauren Greenberg’s stack goes to…Ashley Cox (@melloweducator)! Marie Cruz’s first stack goes to…Susan Roberts (@quiltmom5600)! Marie Cruz’s second stack goes to…Emily Golightly (@emilygolightly3)! Anita Silvey’s three stacks go to… Adison Godfrey (@adisonhaleyy), Alexis Ennis (@Mrs_EnnisOMS), & Donna Miller (@DonnaMiller44)! Mae Respicio’s stack goes to…. Sarah Williams (@teacherSarah21)! Paula Chase’s MG stack goes to… Mary Thomas (@msmarythomas)! Paula Chase’s YA stack goes to… Dani Fouser (@drfouser)! Congratulations to the winners! I hope your students love their books! If you didn’t win, don’t give up! There are plenty of giveaways still going on. Here’s a list of all the other authors who have offered up books and haven’t yet chosen their winner, so they’re still time to enter! If you’re looking for the giveaway of a full class set of The Benefits of Being an Octopus click here. May we all remember what can happen when we come together. Books, kids, and connection – that’s a seriously powerful trifecta! Thank you for thinking of our kids!! Thank you for everything you do on a daily basis. Teachers and librarians are heroes! I’m so glad your students are going to be getting books! Again. THANK YOU. This means the world to me!! We’ll get you the books ASAP! I’m so glad they’re going to get into students hands. I am SO SO SO glad that these books are going to get into the hands of your students!! Thank you for being the advocate for them to make it happen!